Meeting Room 1, National Cycling Centre, Manchester. Ray Pugh (Chairman), John Gillmore (Treasurer), Rob Pugh (Secretary), Ian Small, Mick Style, Mike Plant, Giles Perkins, Isobel Cook, Alan Cook, Richie Watts, Christine Woffindin, Len Woffindin, Val Brailsford, John Brailsford, Dave Headon, Adam Newall, Mick Speirs, John Cooke, Steve Cooke, Mark Turner. Ray Pugh, John Gillmore, Rob Pugh, Len Woffindin, John Brailsford, Ian Small, Mick Style, Dave Haygarth, Dave Headon, Fiona Gillmore, Louise Rhodes, Mick Speirs, Alan Cook. Under 40 – Seniors, Juniors, Under 23 & Veterans who choose to ride in this race. Veterans who choose to ride in this race cannot compete for the Veterans title, only the overall title. 3. Annual League Registration – All S,V,W,J,U23 riders who wish to be a member of the league and qualify for league points and overall competitions must register the with the league each year. The registration fee will be £5 per year; league members will keep their current numbers until the league decides to issue a new set. 4. 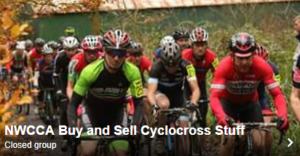 All S,V,W,J,U23 league riders who ride in NWCCA sanctioned Cyclo Cross events, will be expected to assist (or a delegate) at a designated event. This will be organised by the league secretary. When registering to the league the registration form will contain the calendar of the events which the rider must select both 1st and 2nd choice events to assist at. The NWCCA reserve the option to ask the helper or delegate to assist at an event other than their 1st and 2nd choices if required to ensure all events get supported to the desired standard. Training will be required for items A and B to consist of either a pre-season training session, or if unavailable, helping at an earlier event as a shadow. By registering, the rider is hereby agreeing to other his/her assistance to the NWCCA. League riders who offer to help and then fail to provide this service may receive a sanction of withdrawn league points until the duty has been completed, subject to the mitigating circumstances. Average league points can be claimed when assisting up to a maximum of 3 events. 5. All non-league riders will be required to pay a £2 surcharge at each event. This rule is designed to encourage non-league riders to join the league and to assist at a designated event. Non-league riders after entering 2 events will be asked to join the league and assist at 1 event. It is done so in a voluntary manner, to encourage clubs/teams to organise their own events to benefit the NWCCA. 6. Any riders competing in a national trophy or inter-area champs on the same day as a league event can claim average league points up to a maximum of 3 events (1 expected assistance at a league event, 2 trophy/inter-area races). The maximum number of events where average league points can be claimed will be decided each year by the committee. 7. The North West Cyclo Cross Association’s league is calculated at the end of the season and is based on riders’ best results in 75% of that season’s total number of events. This will be subject to annual review. 8. Signing on will close 20mins before all races to give the signing on and judging teams more time to be ready for the race start.